La Paz is the capitol of Baja California Sur, which was founded on May 03, 1535 by Hernan Cortez. 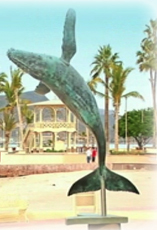 Its history is the oldest registered for any town in the peninsula of Baja California. It wasn’t easy to come to the beautiful city that it is now. The first people that arrived to these lands didn’t have the idea in mind to settle a town here, despite of that they wanted to make fortune on the pearls that it was said could de found in these waters. It took about 300 years to flourish a town on this side of the peninsula. Nowadays, La Paz has become one of the favorite tourist destinations in Baja, because of the small-town atmosphere that is felt here, over the development of the area. There many interesting places to visit as the Cathedral named after Nuestra Señora de La Paz, built 1861, that overlooks the plaza of the town. The Museum of Archaeology of Baja California which displays over 1000 pieces that represent the life of the peninsula. Also we invite you to enjoy the beautiful and serene beaches, as Baranda, El Tecolote and Pichilingue, ideal to practice snorkeling, kayaking, sporfishing and scubadiving. Besides discover the Islands around with their incredible flora and fauna. We recommend you to take guided tours to the Islands. You can arrive to La Paz by plane through its International airport, by bus and by car. Also there is a Ferry service that takes you to Mazatlan or Topolobampo on the mainland. For more information contact your travel agent or visit this web page for more tips and news. - Beaches: south of the city on your way to pichilingue, are to be enjoyed, like Coromuel, Caimancito, Tesoro, Pichilingue, Balandra y Tecolote. Clear and warm waters years round and with services as showers, restrooms, restaurants and aquatic sports rentals. - Sporfishing: all year round capturing cabrilla, dorado, groupers, blue marlin, jack cravelle, blank marlin, striped marlin, roosterfish, sailfish, sierra, wahoo, yellowfin and yellowtail, etc. - Scubadiving: is rewarded by the incredible sites as El Bajo an underwater mountain rising 60 ft. from surface where the schooling hammerheads were first spotted, Los Islotes, home for more that 350 very playful sea lions, Salvatierra a ferry shipwreck sunk in 1976, Las Animas a collection of tiny islets in front of San Jose Island, La Reina and la Reinita islets in front of Cerralvo Islands. - Ecoturism expeditions: are fascinating because the wonderful flora and fauna of this land and waters, some agencies to contact are Baja Expeditions, tel. 01-112-53828 and Baja Diving & Service, tel. 01-112-21826, Baja Outdoor Activities, tel. 01-112-55636. - Observation of Flora and Fauna: are excellent while relaxing on the beach or touring along the roads of this land full of contrasts and breathtaking views.